The DriveSmart 61LMT is the replacement for what we think is the best SatNav in 2016 the DriveSmart 50LMT and for a satnav that only has a slight change in the name, there are major changes in the unit that affect whether you're going to like this sat nav or not. Personally I have always hated 5-inch screens as I feel they are too small and do not show enough information. If you’re driving a small sports car, then a 5-inch sat nav might be great, but for me, I have always like the six inch units. The problem with the Garmin DriveSmart Range, there is no six inch screen. There are two models, a 51LMT with a 5-inch screen or a 61LMT with a 6.95Inch screen. 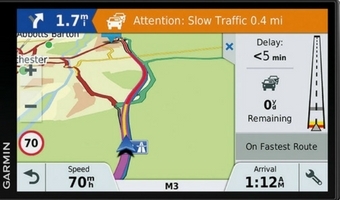 There’s no more 6-inch screen and therefore potentially no more favorite satnav in the UK for Garmin. If you want to know what I thought was the best satnav for your car in 2018, check it out here. Other than having only two models, the other big change between the 50LMT and the 51LMT is the all new “S” (Satellite) and “D” (Digital) powered models. The digital is substantially more expensive than the satellite, however in certain situations, it performs much better. The Satellite version simply connects your satnav to satellites in the sky, however the digital works slightly differently and can be much more effective. The biggest from with your sat nav receiving information via satellites, is they can often get blocked by mountains ranges, trees or even dense weather. Digital does not suffer from this same problem and therefore whilst digital satnavs are substantially more expensive, they are worth the extra money if you plan drive in the countryside where signal strength can be a problem. If you’re only going to be driving in the city, personally I would be saving the money and buying the satellite version. In terms of design not much has changed with the 51LMT, however there is a big change with the 61LMT’s design. The biggest problem we had with a 7-inch satnav was that by the time you added the unit around the screen, the actual device was huge and did not fit into either the glove-box or in most cars, the central storage compartment. Garmin have acted on this problem meaning that whilst the 61LMT does have a 7-inch screen, it's an edge-to-edge screen meaning that actually the new 61LMT not only looks better, but also should fit into a standard glove-box for storage. As with all Garmin’s, as soon as you switch on the the unit, it fires up and reveals Garmin’s menu interface which is clean, clear and easy to use. After you’ve entered your destination, the directions are clear, precise and most importantly easy to follow, however they have not changed much from previous versions. But of all the new features that come with the Garmin DriveSmart range, the all new points of interest database is easily the best now that Garmin has added TripAdvisor to the new units. This means that not only are you now getting a truly massive points of interest database, but you can also read others reviews directly from your navigator. We loved the Garmin old DriveSmart range of navigators so much we gave it our best sat nav award, however this new range is taken the whole value for money concept to the next level. The differences between the maps and directions between TomTom and Garmin is very small, however this TripAdvisor feature takes the Garmin range to a whole new level. It’s way ahead of the TomTom’s unlike either the DriveAssist or the DriveLuxe offers real value for money to those who are using it.